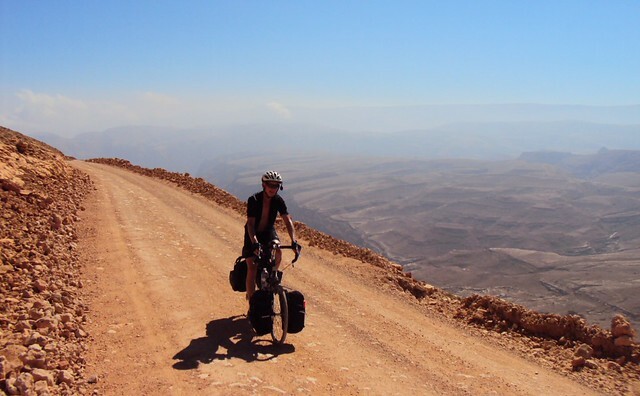 As of February 2013, Will had cycled from England to Iran, on his way around the world. 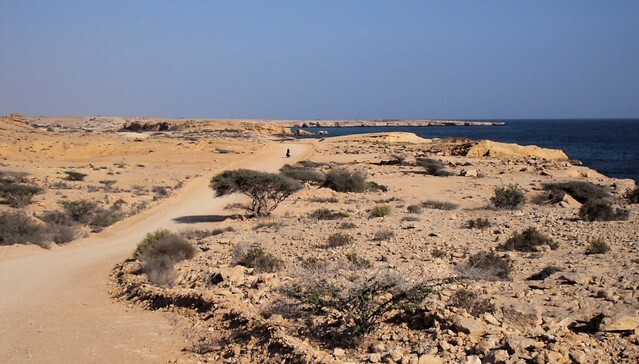 Once Jack and I arrived at the coast at Al-Ashkharah, we reevaluated our plans for Oman, after not enjoying the route we had taken so far. 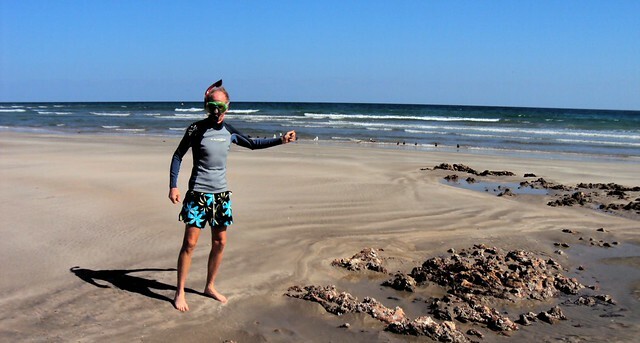 We knew of good snorkeling in Oman and had brought snorkel gear with us so we decided to move slowly along the coast seeing if we could find underwater magic. In a time when everything is easily accessible on the internet, it seems to me it’s still very difficult to learn where there is good, beach-accessible snorkeling. It’s even hard, for example, to find snorkeling information for Sulawesi even though that’s considered one of the best places in the world for diving. In all these places the visibility was very poor, there were few fish and no coral. 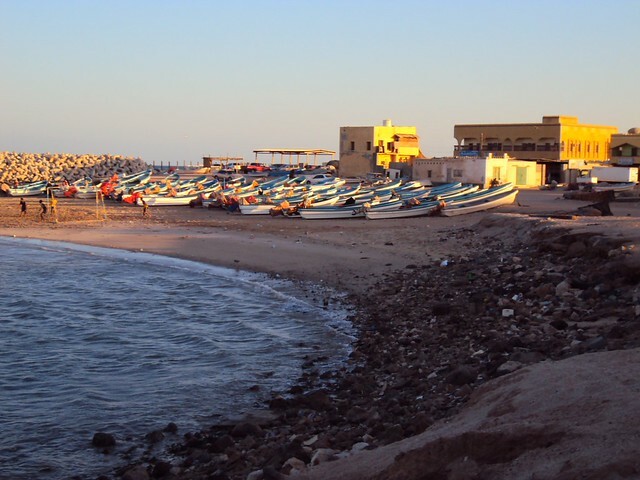 That evening we camped at Ras Al-Jinz, famous as a nesting site for a huge number of sea turtles. We signed up for an evening tour to see the turtles, but, alas, the tour didn’t happen because the rangers couldn’t find any turtles. Really, that’s to be expected at this time of year, but the beach was only about 6km off our route so it was worth trying. What amazed us there was seeing dozens of tourists, mostly foreigners. 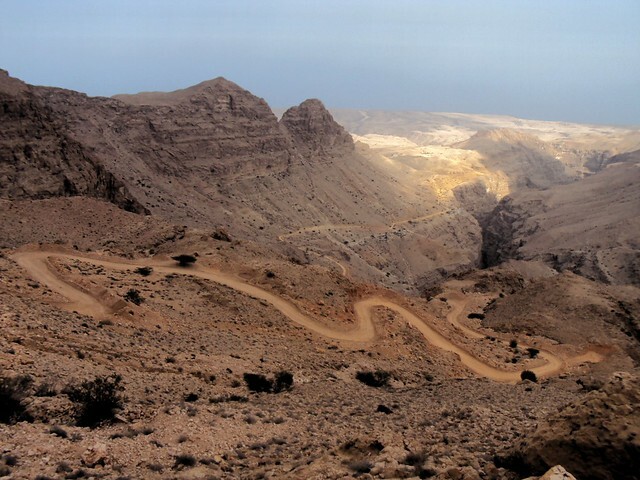 We hardly saw any foreign tourists during our first week in Oman. On the coast, we also started running into bicycle tourers: Julian from Innsbruck, a well-traveled couple from the Netherlands, an adventurous couple from Italy, and strong Peter from Switzerland. 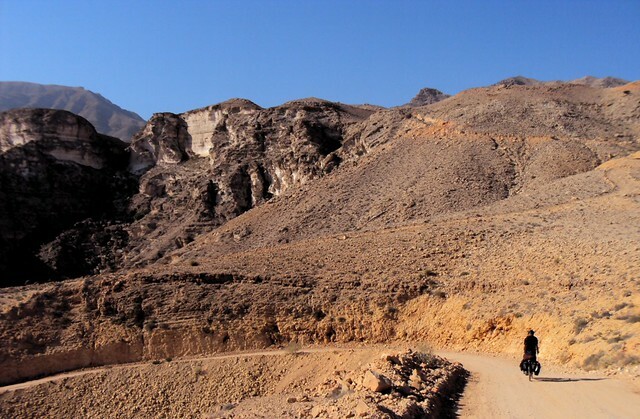 Talking with these fellow tourers, especially the Italians, Jack and I completely abandoned our plan to ride to Nizwa and decided instead to visit wadis and ride some loops off the main coastal highway between Sur and Muscat. 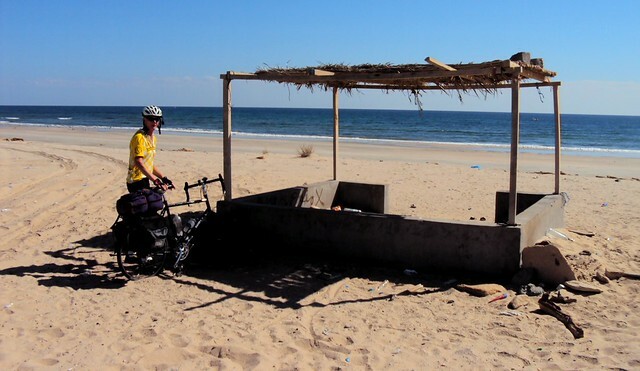 It was a good call, and this is how we ended up spending the rest of our time together in Oman. 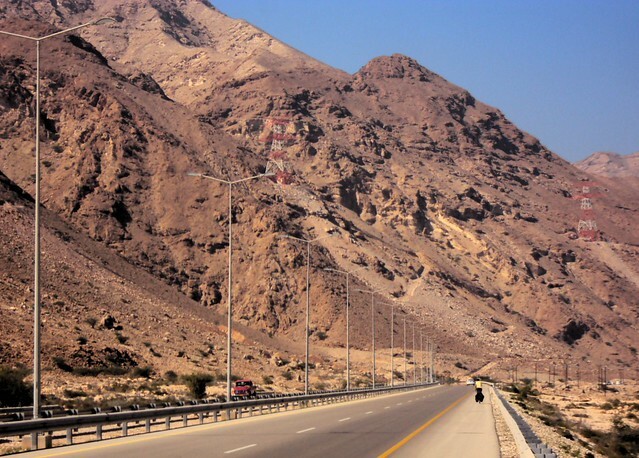 Even though it’s a big highway there’s nice scenery along the Muscat-Sur road. In As-Siwayh we stopped at the mosque to get some water (it was always easy to find drinking water at the mosques in Oman), and the friendly Bangladeshi imams let us use the shower at the mosque as well. We ended up sleeping behind a wall (to get out of the wind) at the municipal beach park in the same town. 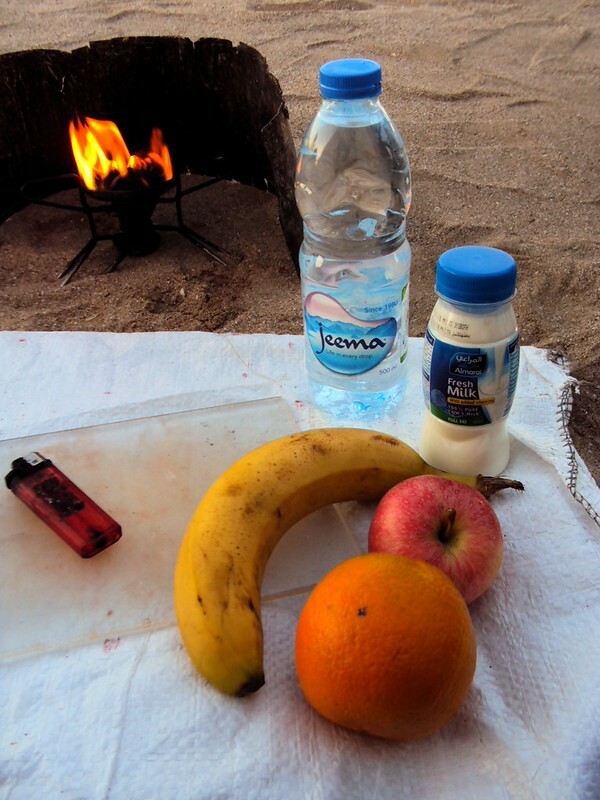 What a surprise to wake up in the morning and find that each of us had a small care package outside our tents: an apple, orange, banana, and bottles of milk and water from a kind, anonymous Omani! 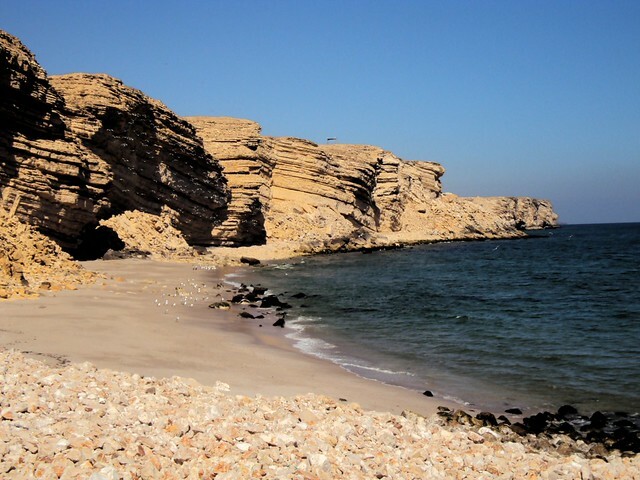 Sur is a port city, the most populous place between between Muscat on the north coast and Salalah in very south of the country. 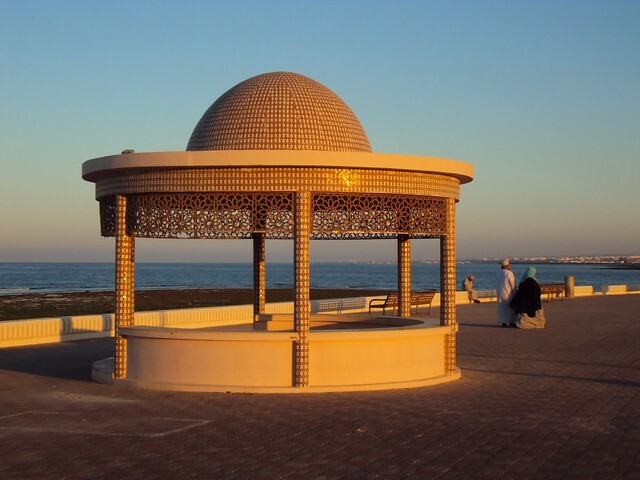 It’s many travelers favorite city in Oman, and we were hoping maybe to hangout for a day or two there. There was a nice boardwalk along the coast, but the downtown twisty alleys which could be quite nice were run-down and dirty. There was nothing to keep us there for the night. 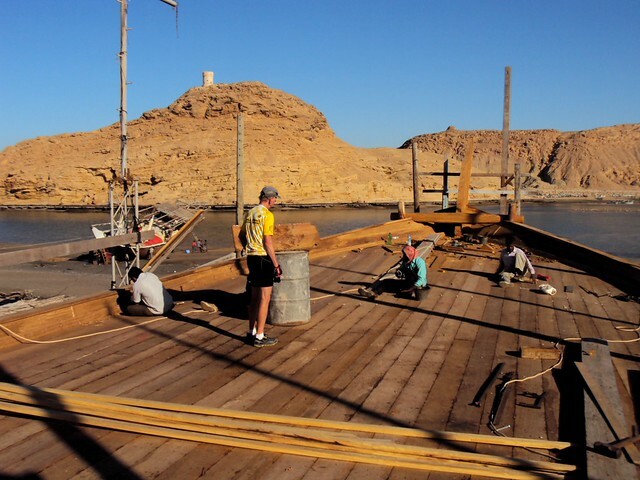 Traditional wooden dhows are still made in Sur, now by a largely Indian labor force. Apparently Qatar ordered seven of these boats (prepaid at 300,000 OMR (US$780,000) each) to be delivered in time for their hosting (or not?!) of the 2022 World Cup. The highlight of our short stay in Sur was being able to walk right onto the deck of one of these boats and watch the craftsmen at work. 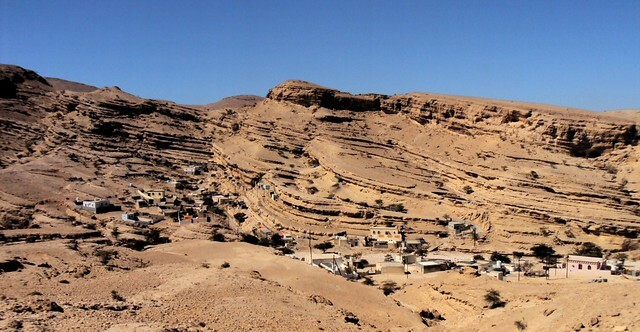 North of Sur we spent three hours exploring Wadi Shab. 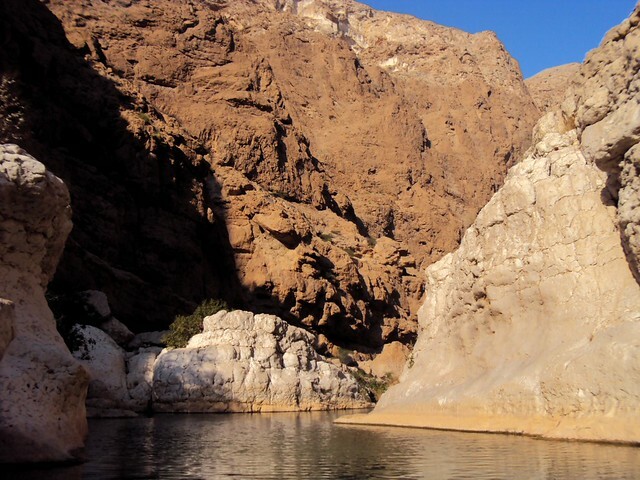 If you’re anywhere near Wadi Shab, you should not miss it. It’s a deep canyon with year-round running water. 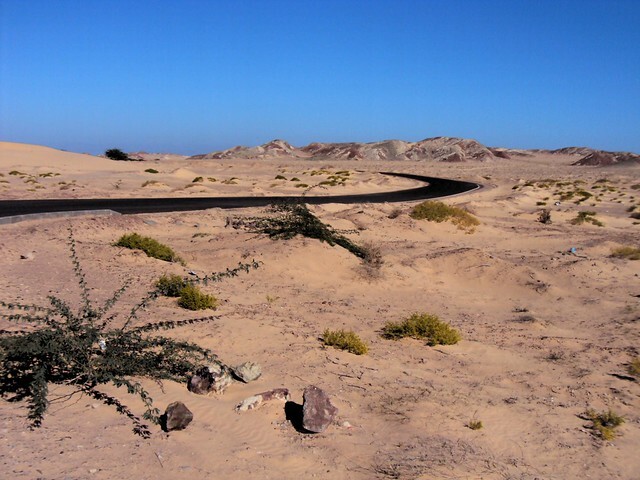 We started by taking a boat across a small lake and then walking up canyon by irrigated areas of banana and date palm. After about 45 minutes of walking, the canyon narrowed, and we were forced to walk in the water and then swim (thus, no photos). We ended up swimming through some narrows just big enough to squeeze through which then opened up into a large pool with a waterfall. Incredible. There were foreign and Omani tourists, and we ended up talking to one young, recently married Omani couple. On the boat ride back across the lake, the new bride let me photo the henna still on her hands from the wedding. 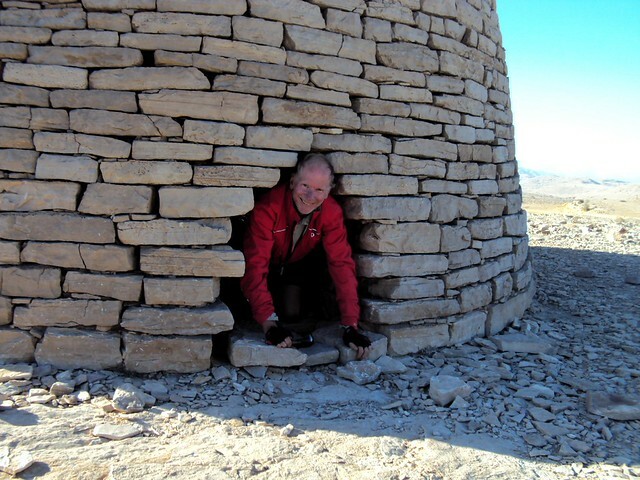 The most challenging and also most rewarding excursion Jack and I did in Oman was to leave the coast and visit the Beehive Tombs (aka Tower Tombs) high on the Salma Plateau. 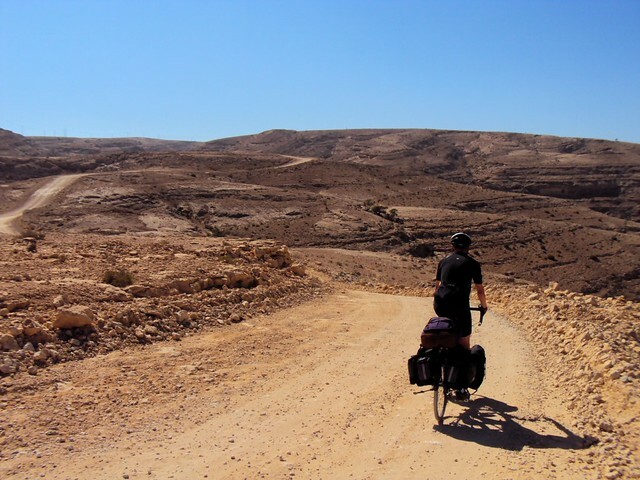 It was a loop of superlatives: probably the most climbing I’ve done in a 70km loop on my touring bicycle, on the steepest roads I’ve ever ridden, to get to some of the oldest man-made structures I’ve ever seen. We made it up the first 1100m of climbing in the first afternoon after stocking up on food in Fins. 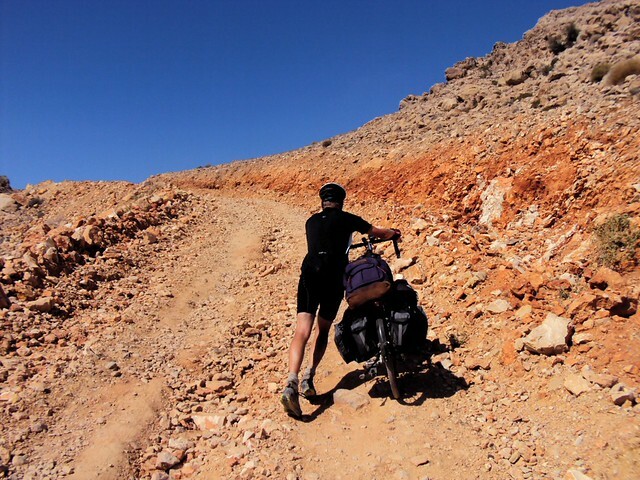 The steepest sections of road were paved, but even with the pavement I couldn’t push my bike up the steepest parts. I measured one straight-away — I’m not talking about the inside of a turn or something, no the straightaway — at 32%! I don’t know that I realized it was possible to build roads so steep. It took two of us to push one bike up the most difficult sections. We found a nice campsite overlooking a gorge. The following day was steep as well but ridable, normal steep. Jack estimated he walked/pushed 90% on the first day but only 10% on the second day. 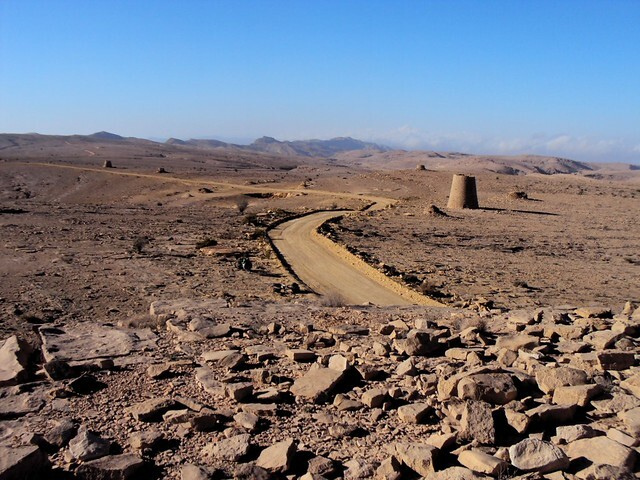 We made our way slowly up to about 1800m via the bleak hamlet of Qurun and eventually came to the rocky, barren expanse dotted with Beehive Tombs! 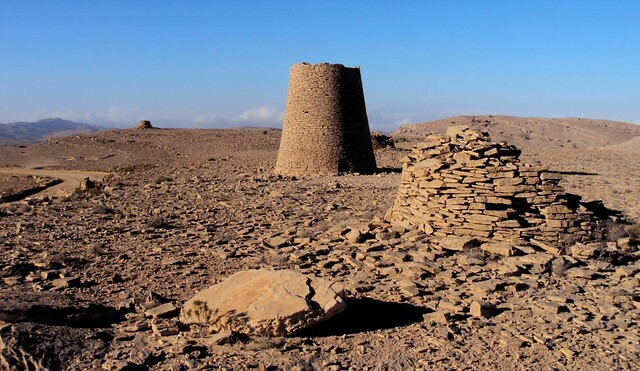 The Beehive Tombs at Bat and Al-Ayn in Oman are recognized by UNESCO as World Heritage Sites. 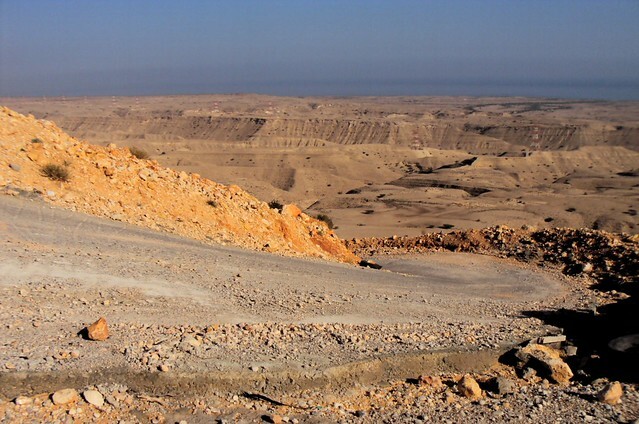 They’re much easier to access than the ones we visited here at Jaylah/Salma Plateau. According to some accounts the ones we visited are better preserved. 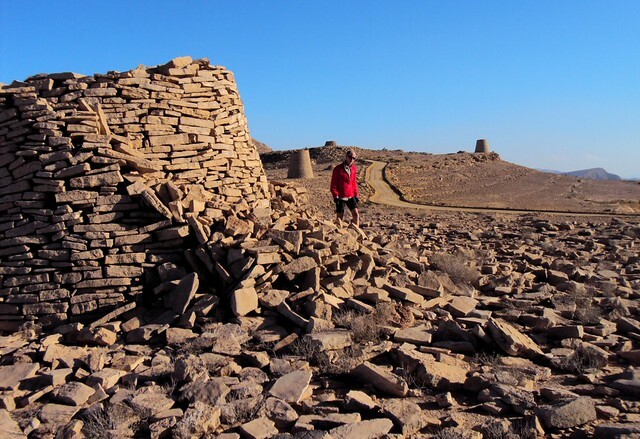 What’s incredible is just how old these things are — 5000 years! 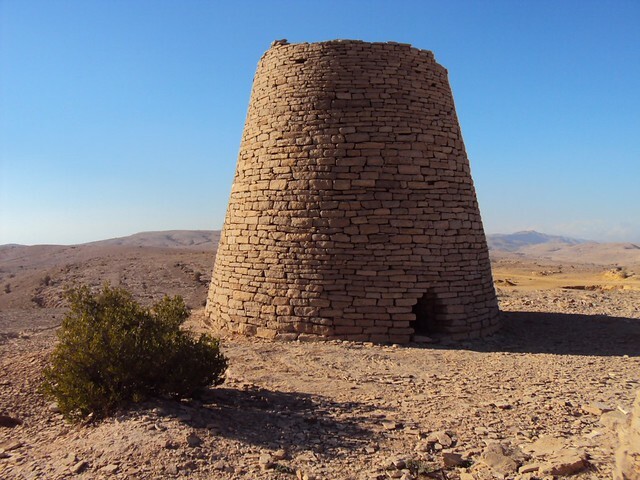 — older than the pyramids at Giza. And as you can see from the photos, some are remarkably well-preserved. I was very impressed. To keep out of the cold we spent that night in a small nearby mosque where we could close the door and turn on the electric heater. 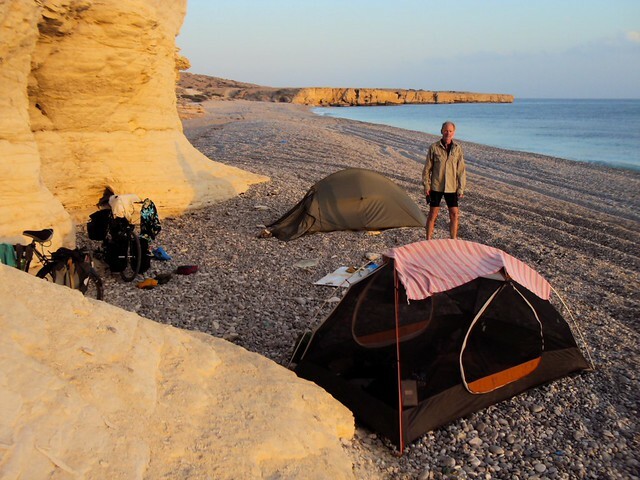 My light summer sleeping bag had been enough for every night in Oman but had we slept outside that night at 1800m I would have definitely been cold. 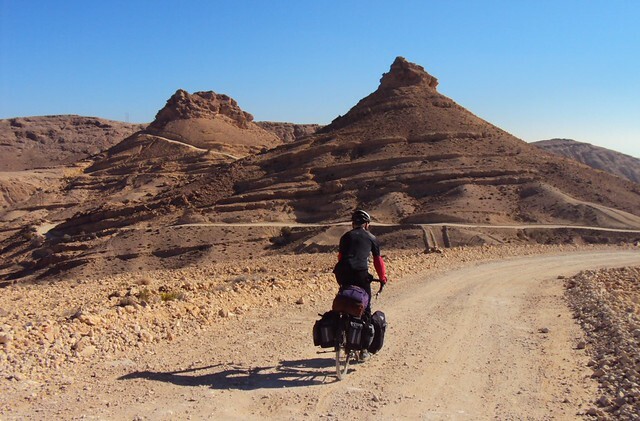 We had some nice riding up high the following day before the plunge back to sea level. 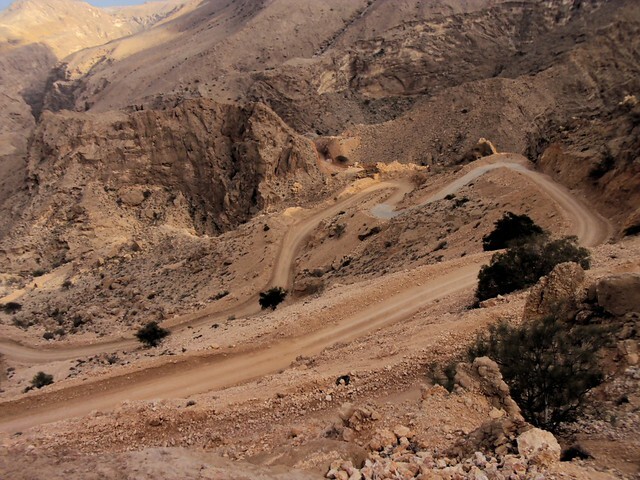 This road might have been even steeper than the one we came up. Jack walked much of the incredibly steep section of the descent. I rode most of it and was happy that I only fell once. Many years ago I stayed with Yoshi at Lake Suwa on Honshu. 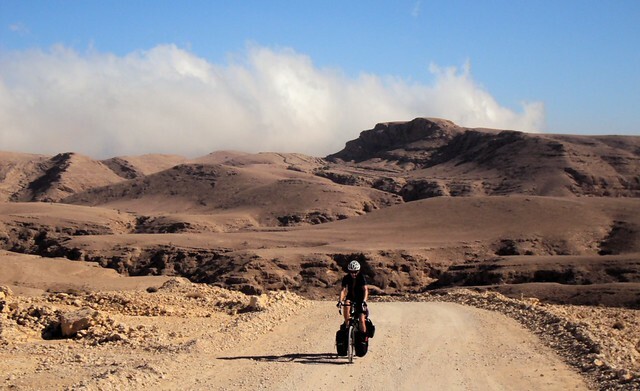 He had spent seven years bicycling around the world in 107 countries. 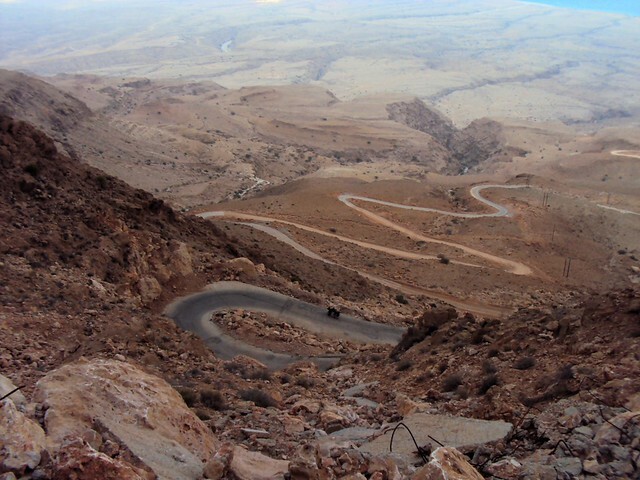 I remember he told me the steepest roads he’d ever seen were in Cameroon. 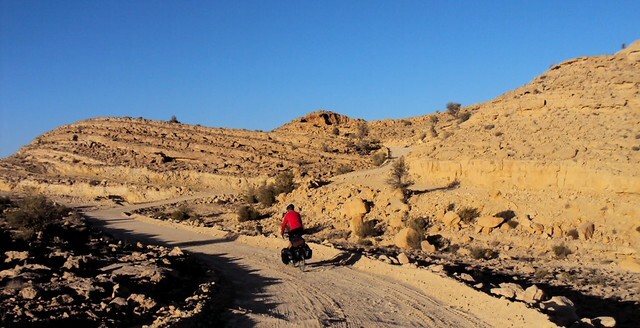 I’ve never been there, and I wonder now if Yoshi had bicycled in Oman. 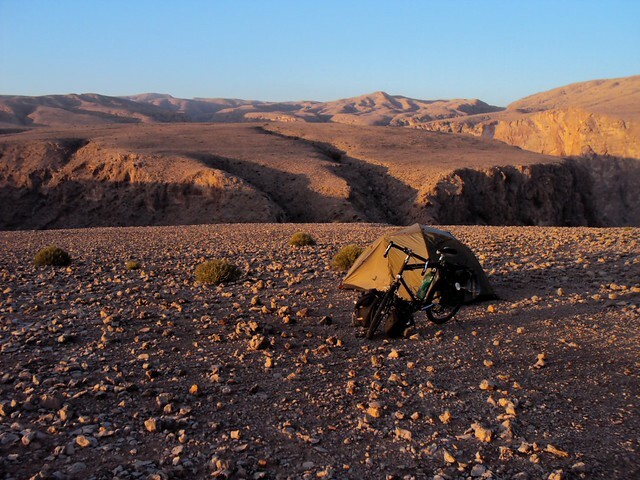 This entry was posted in Bicycle touring, Oman and tagged Al-Ashkharah, As-Siwayh, Fins, Jaylah, Qurun, Ras Al-Jinz, Salma Plateau, Sur, Wadi Shab. Bookmark the permalink.